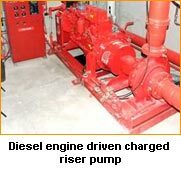 Argus Fire Protection’s experienced team are able to assist you with the engineering, design, installation, maintenance and testing of fire hydrant and charged riser systems. 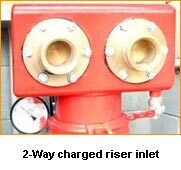 Fire hydrant and charged riser systems within buildings should be designed, installed, maintained and tested in accordance with the requirements of NZS4540 – Fire Hydrant Systems For Buildings. Site fire hydrant systems should be designed, installed, maintained and tested in accordance with the requirements of SNZ PAS4509 – New Zealand Fire Service Fire Fighting Water Supplies Code of Practice. Dry risers were installed to NZS 4510:1978 and are no longer permitted for new buildings. 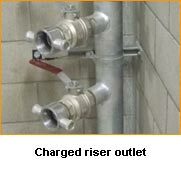 It is recommended that existing dry risers are converted to a charged riser, on a reasonably practicable basis. A vertical pipe installed in a building for fire fighting purposes and permanently charged with water from a pressurised supply sufficient for fire fighting, and fitted with landing valves at specified points. Wet risers were installed to superseded editions of NZS4510 and are now not normally installed.